First Day. As soon as I was awake at around 9:00am, I checked the forecast on my VHF radio. Not encouraging, to say the least: the first major frontal system of the season was approaching. The forecast was promising gale-force winds tomorrow. 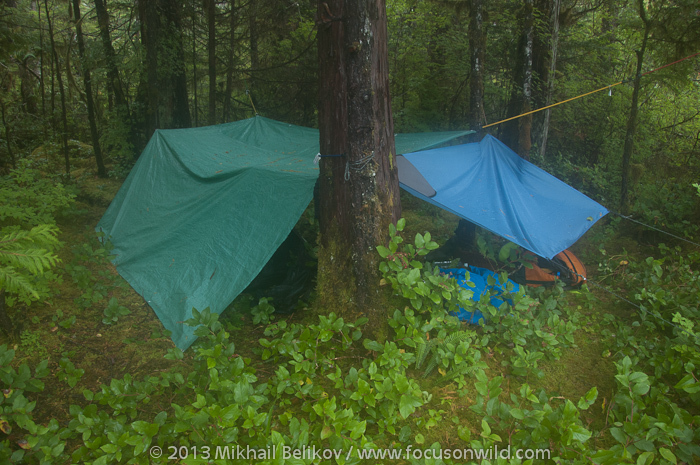 The rain had been pouring outside; however, just when I stepped out of my tent, the rain had stopped. I had immediately taken advantage of dry skies: found a nice cooking place with a view in the tidal zone and fired up my wood stove. As if waiting for this moment, the rain had returned, initially as a drizzle, changing into a downpour. Had moved back under my cooking tarp, but still lost the fire in the stove. It took me some time to fire it up again. Started with a breakfast of coffee and biscuits, then boiled odd parts of salmon and fried six fillets, each making at least one very generous portion. Salted the rest, about one half of the salmon. By the time I was done with the fish, it was already a lunch time. Enjoyed fried salmon with mashed potatoes and a cup of tea. 2:00pm, and the rain was still going strong. After a morning of hard work, I had treated myself to a nap accompanied by the drumming sounds of water falling on my tarp. Woke up at 4:00pm: with nothing else to do, I had decided to have an early dinner. Heated up fish stock and made mashed potatoes accompanied by a large chunk of salmon. Concluded the dinner with a cup of raspberry tea. While washing my dishes, I had noticed that a second sailboat had found a refuge in this protected cove. A powerful noise had been building up in tree tops all around me: likely, very strong winds, almost unnoticeable inside the well-protected cove, if it was not for that noise and ripples on the water surface. Retired to the tent, wrote up my travel notes, listened to the 9:30pm forecast on my VHF radio. No encouraging news: the system with an 895 mbar low, formed in the Gulf of Alaska, would bring more gale-force winds and rain. The barometric pressure was falling all around, confirming my own barometer readings. Staying for another day for sure. Before going to bed, I congratulated myself on selecting a protected and comfortable place for weathering this prolonged storm. Like many times before, I had noticed again how a noise of the wind in the forest was resembling a chanting human voice. No wonder that people believed in forest-inhabiting spirits and in witches casting spells on dark foul nights. Second Day. When I woke up at 7:00am next morning, it was still windy and rainy: quite a miserable day. Tried to find CBC Vancouver on my shortwave radio, unsuccessfully. Had managed to locate the BBC News and got updated on world events. The VHF forecast was not improving: the system had become quasi-stationary, the winds would be getting even stronger, and the whole thing was going to last for at least a couple more days. After updating my diary, I had drifted asleep until 11:00am. Cooking on a wood stove in this weather had promised to be a less than pleasant experience. With my supply of dry wood, collected just before the storm and stored under the tarp, dwindling, I had decided to skip making hot breakfasts to resort to a two hot meals a day routine: this was my usual approach on paddling days (sometimes even only one hot meal a day), although this time I was not going anywhere anytime soon. On the night of my arrival to Alston Cove I had salted salmon roe, and it was now ready for consumption. Deciding for some reason to treat myself to a decadent meal of blinis with caviar, I had mixed self-raising flour and water. However, the dough was refusing to raise. At the end, after trying this and that, I had made something palatable -- I would have only called it blinis in the conditions like these. After finishing my lunch, with the thermos filled with coffee for the next morning, I had felt that it was the time to start exploring my surroundings, rain or no rain. Dressed up in the water-proof kayaking outfit, with my camera safely stored in a dry bag and a mouth-blown fog horn hanging around my neck, I was ready to go. As I did not have a bear spray on this trip, the fog horn was my only line of defense against bears. Overall, it was a loud device; however, my experience a few months earlier on Haida Gwaii had shown that a determined bear would simply ignore it. Still, it was better than nothing. As a an additional safety measure before stepping away from my camp, I had left a note at my tent entrance giving the date, the direction of my exploratory trip (essentially up the main creek), and the time when I was expecting to return. First, I had to cross two smaller creeks. 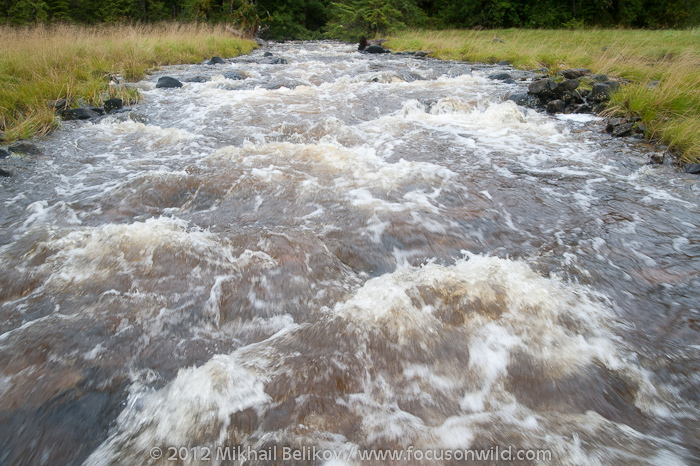 Nothing more than tiny flows of water on my arrival, they were now several metres-wide roaring streams. The second one was way too powerful: I had to find a sturdy pole to assist with crossing. 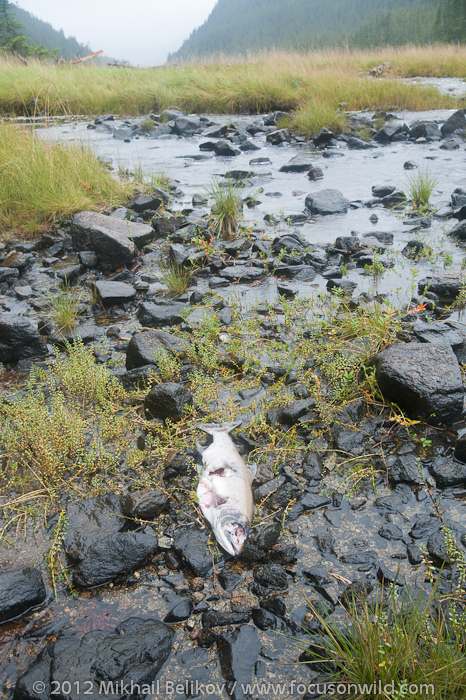 In the tidal area of the main creek I had found a salmon carcass. I could not tell if the fish had been caught here or flushed from the upstream. 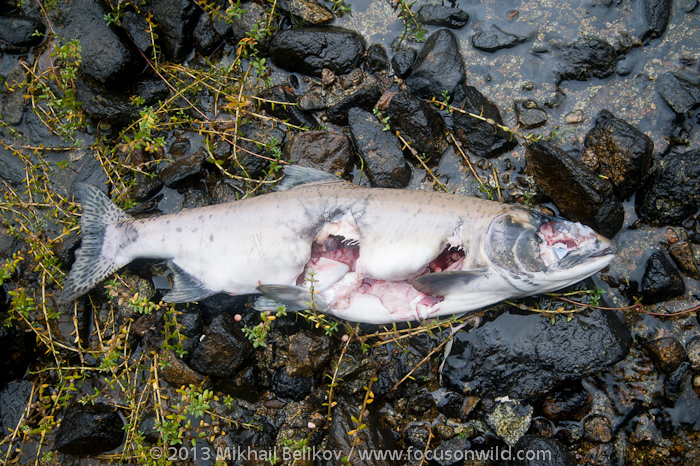 One point was clear: with lots of roe still inside, this female had not had a chance to spawn. The ripped open stomach was suggestive of a well-fed bear preferring salmon roe. When fish is abundant, bears often eat only the parts they like most. Some never touch stomach content eating only flesh, some prefer heads, and some go for roe leaving everything else to other creatures. Following an animal trail along the main creek (Blee Creek, according to the chart), I had quickly reached the fallen log that I had observed two days earlier, blocking boat access further upstream. I kept following the trail upstream. Initially, it had continued along the shore but then started climbing up the slope taking me further and further away from the creek. At some point, I had decided to get back to the creek and started descending, choosing the shortest direct route. Without a trail to guide me through the forest, I had quickly ended up in multi-story mess of piled up fallen trees overgrown with vegetation, including Devil's Club -- a nasty plant covered in sharp thorns. After lots of crawling, climbing and walking on slippery logs, I had finally reached the creek, now gently flowing through meadows. 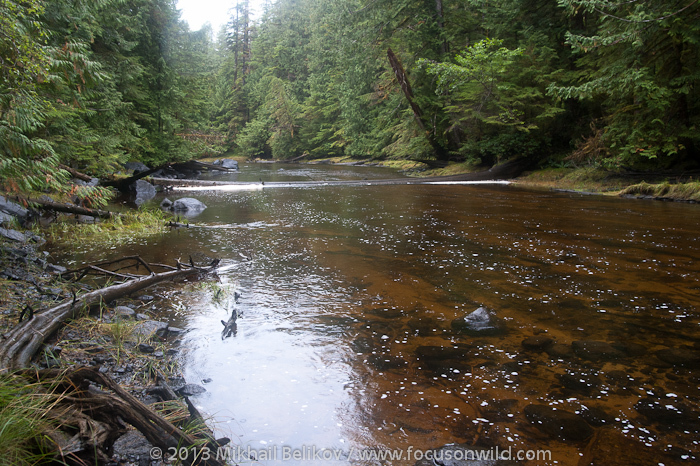 Started walking back to the camp, downstream, sometimes along the creek, sometimes inside if the water was not too deep or turbulent. On a way back, collected a few strands of black hair: no signs of a spirit bear. By the time I had returned, it was already 6:00pm. Gathered some wood, then had tried to get my stove going for some time. It did not want to: the new wood was way too wet. Fortunately, I still had a bit of dry wood left, collected before the storm. With its help, I had fired up the stove and finally boiled some water. Tea, remaining blinis and caviar, and a big chunk of salmon made my dinner. In bed by 11:00pm. Third Day. I woke up at 7:00am: the rain and gusty winds. Went to sleep again, until 9:00am. Updated my diary, listened to CBC Vancouver, then checked the VHF forecast: all the same story. One piece of good news was that the barometric pressure had started to rise: end of the storm was finally in sight. Time to get out of the tent and face the rain. Mashed potatoes and remaining cooked salmon made my brunch, followed by a cup of coffee from the thermos. After refilling the thermos so I would have a hot drink upon my return, I had again departed for Blee Creek. 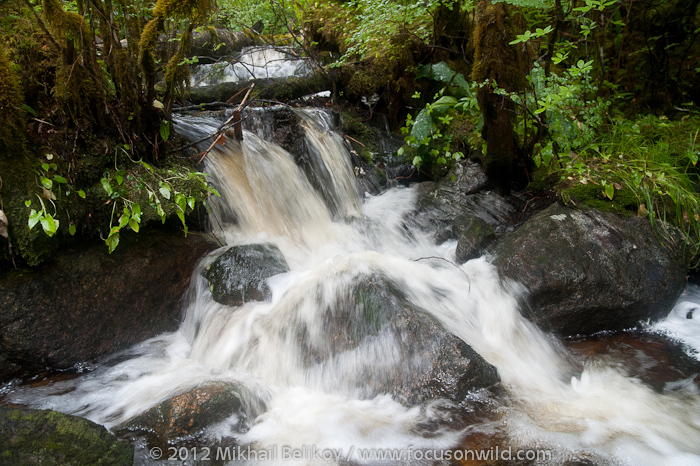 Water, water everywhere: on the ground, falling from the sky, coming down the slopes in numerous streams. 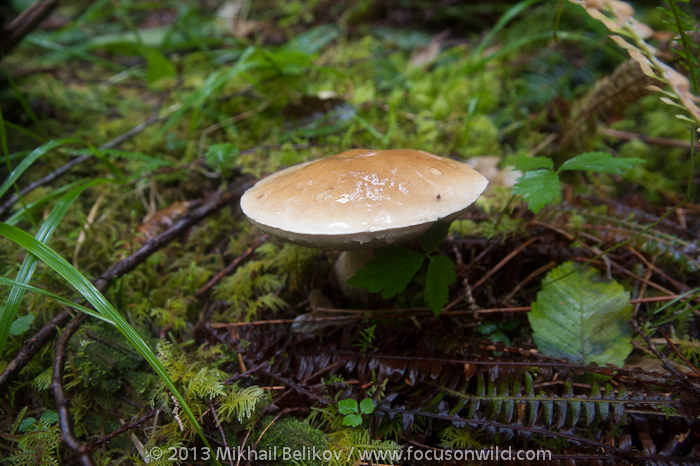 I had not seen many edible mushrooms in this forest, possibly too dense and dark for them to grow. This one was in a small opening, likely a species of Boletus, and edible. As I still had plenty of salmon, I left it alone. 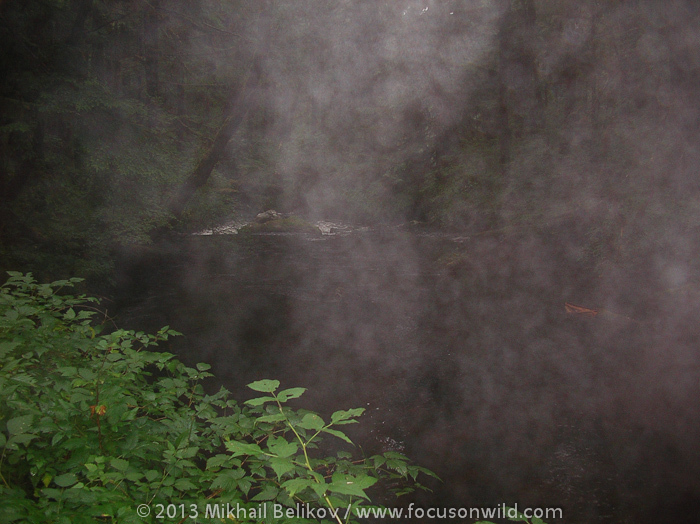 Just when I started walking up the stream, the rain had intensified. 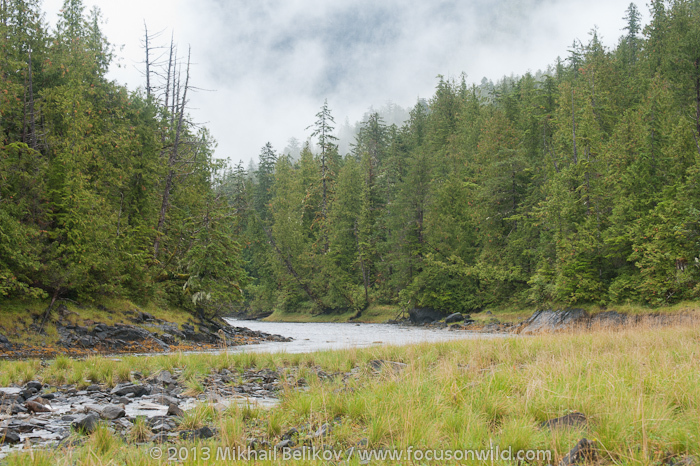 The creek was full of salmon, but deprived of any other wildlife: not even birds. Likely, all creatures had been in hiding, waiting until the rain had eased or stopped. After reaching a "bridge", a log used by bears for crossing the stream, I had positioned myself some distance away hoping to observe one of the fellows. Waited for about an hour, getting soaked, at least outside, to no avail. Finally, packed up and headed back along the creek to my camp. After a bit of rest, I had cooked mashed potatoes (they were so easy to make -- just add hot water), had a piece of salmon and completed my dinner with a cup of tea. In tent by 10:00pm, ready for the night. Rain was still pouring outside, but almost no wind. Likely, staying for one more day in the cove. Fourth Day. Woke up at 9:00am. Drizzling, and no wind. Both sailboats were gone -- likely, took advantage of the calm and left earlier in the morning. I was again alone. 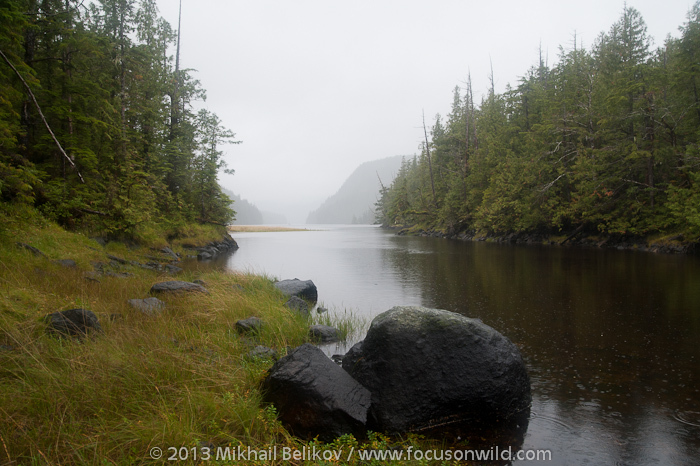 Just when I started thinking about packing up and leaving the cove, the drizzle had turned into a steady rain, and this had settled the matter: staying for yet another day. The barometric pressure kept rising: a very good sign that the worst was over. Spent two frustrating hours trying to cook my brunch. I was out of the dry wood collected before the storm, and all what I could find in the forest now was soaking wet. The rain had stopped in the afternoon and I could finally see the clouds: in past it was just a dull grey overcast. Decided to take advantage of dry hours and try getting as far up the creek as I could. After two hours of exhausting efforts, I had gotten farer up the creek than I had ever been before. However, when I checked the GPS, it was only one km from the shore, as the crow flew. 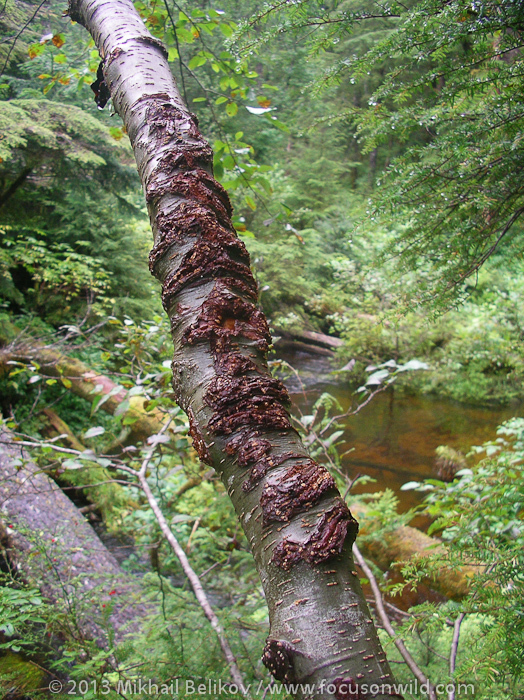 No animals in sight; however, plenty of signs of bear presence, including log bridges and marking trees, some with old healed scars and some with more recent ones. It was already 4:00pm: time to turn back if I did not want to risk wandering in the dark. On my way back, I had taken a picture of the creek with my waterproof point & shoot camera, hand-held. The camera kept complaining about not having enough light and that the flash should be turned on. Knowing in advance that this was a bad idea, I still decided to oblige and see what would happen. Sure enough, the only thing clearly visible in the image with the flash on was the moisture in the air. Good reference photographs to retain and demonstrate during my workshops to highlight disadvantages of using the flash when the air humidity was very high. While trying to avoid a bad spot on the trail along the creek, I had again managed to get into a multi-story tree pile-up on a slope. Climbing, squeezing, jumping, almost falling from slippery logs, often so rotten that they were just waiting to collapse under me, plus more than a few encounters with Devil's Club: I could not claim that this was a pleasant experience. 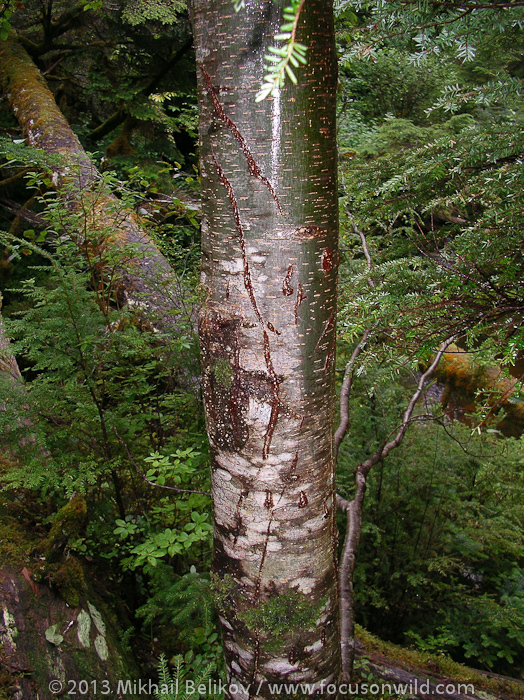 Overall, following animal trails had been the best strategy in temperate rainforests. However, sooner or later, the trail would go under a fallen tree, too low for me to squeeze under without crawling on wet and often muddy grounds. Or it would turn into a tunnel through a dense and thorny vegetation. Again, it was either crawling and ripping my clothes or trying to find a detour, often ending up in an impenetrable jungle. 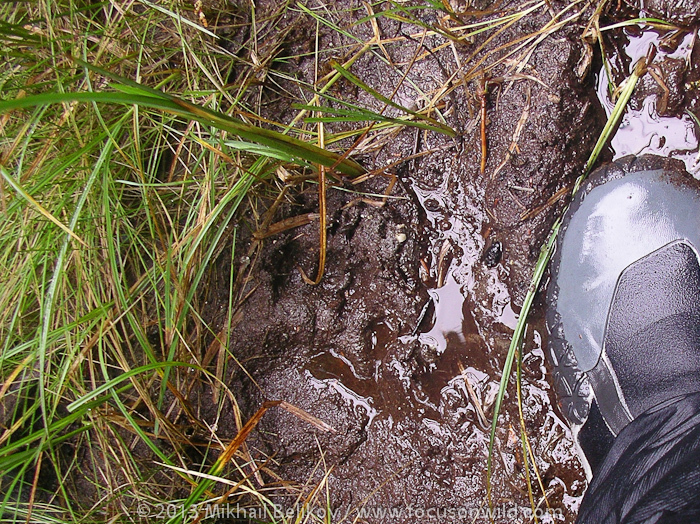 Finally, I was back on the trail, spotting a small bear footprint, likely a juvenile. I was back to my camp by 6:00pm, after four exhausting hours. The light was still good and I took a few pictures of my encampment that had provided me with a reasonably good shelter for four stormy days. 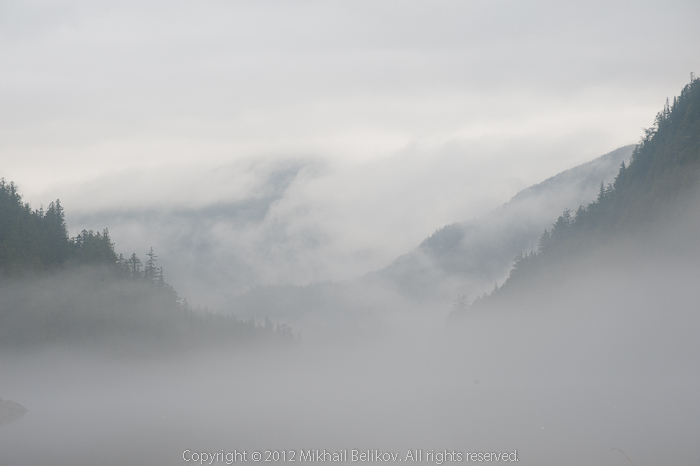 The cove was filled up with fog: a beautiful scene. Made several photos, likely the best landscape images of this trip to date. After enjoying a refreshing bath in a tiny creek, I had to dedicate two hours to cooking my dinner. All fire wood was soaking wet; the fire kept going off and I had to restart my stove several times. Finally, I had boiled salted salmon and made mashed potatoes, then completed the meal with tea, with the rest of boiled water going into the thermos to have a warm cup of coffee next morning. In bed by 11:00pm. With four days already lost in the first storm of the season and more storms coming for sure, I had recalled the warning given me in Klemtu that the weather was closing in and that I had chosen a wrong season. He was right, of course, about the weather. 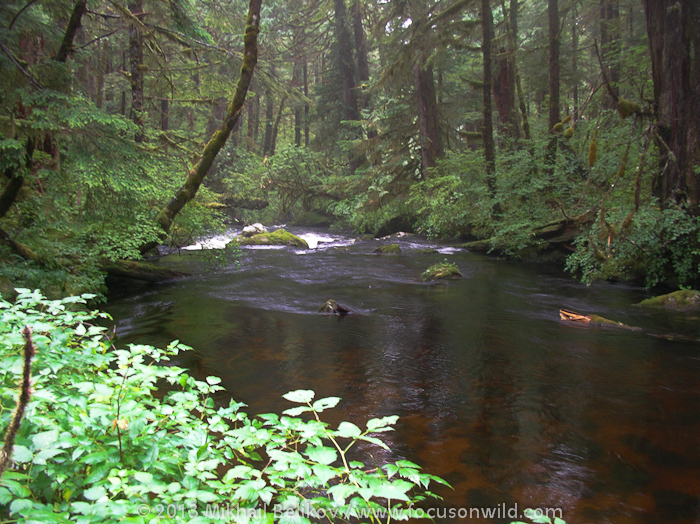 As to the season -- with the salmon run at a full swing, I still hoped that I would be able to observe and appreciate this wonder of nature, and see my bears and other wildlife. The second biggest challenge, after weathering the storms, was the photography: in this extremely wet environment I had to find a way to photograph without losing my equipment to the moisture, temporary or permanently. Keeping the cameras dry would be an ongoing challenge. It was also clear that I had no chance to safely circumnavigate the island at this time of the year. From now on, my plan for the remaining part of my expedition had become to concentrate on exploring Laredo Inlet, keeping an eye on the weather and available campsites, making sure that I would be at a safe and convenient spot when the next storm hit. My following destination was Bay of Plenty on the opposite side of Laredo Inlet, about 10-15 km away, depending of where I was planning to camp. 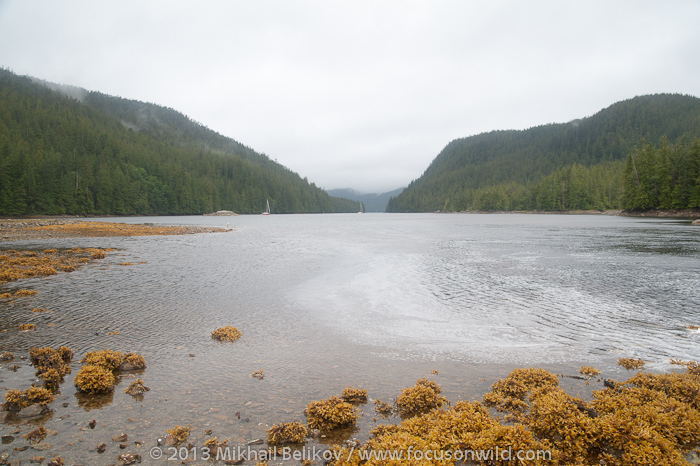 The couple from the sailboat was there a week earlier, observing a very robust salmon run. The alarm was set for 6:00am; however, I could not fall asleep: dull pain on the right side of my chest was keeping me awake. No matter what I tried, I could not find a comfortable position eliminating or at least reducing the suffering. Did not recall falling and cracking my ribs: likely, overstretched muscles.